There are many reasons you might need to isolate a single record in a table. 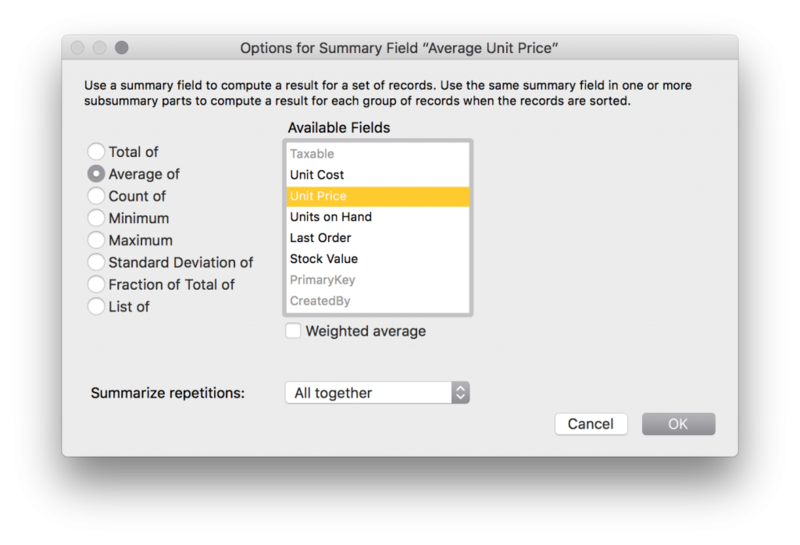 This post looks at methods to do this in FileMaker databases, along with pros and cons for each. This method may be the most obvious – perform a find that will return only the current record. To do this, you need to search for something that is unique about the record. While there may be unique data in the record such as a product code or member number, it is always safe to search on the one thing that should always exist and must always be unique – the primary key. What we are doing here is first storing the primary key value in a variable. Then we get into Find mode and construct the request – setting the primary key field to search for the primary key value we put into the variable. Then perform the find to return one and only one record. The Perform Find step has a stored find the same as the one constructed in the first example. Many developers see the first example as self-documenting code. In the second example, you would need to open the second script step options to see what was being restored. Either way, you will always return just one record using this method. The downside is that this process must be scripted – there should be no user access to the primary key field. The advantages of this method are the simplicity and that it can be performed manually with two shortcuts and a menu command. The downside is that there is an edge case where it can break in an active multi-user environment (returning more than one record). If you are scripting this, it may be useful to test that you have a found set of exactly one record before proceeding. As for #1, this method will always correctly isolate the current record. The downsides are that it is requires a scripted process, and that you need to add a TO to your relationship graph. In all of the above, the aim of scripting will be to do no harm (or as little as possible) to the current working environment of the user. For example, if a user has a specific found set of records sorted in a particular order and is currently on the fourth record, that is where you would ideally return the user after they run a script. In most cases, this is most effectively done by creating a new window and performing all following operations in there. At the end of the process, you can simply close the window and that returns the user to their starting environment. Do you use any other methods to isolate the current record? Post a comment below. What is an API and why should you care? APIs are the means by which your FileMaker solution can access all kinds of services and interface with other data stores. When you get a little understanding of this, the world of systems integration really opens up for you. API stands for Application Program Interface. It is the interface by which an application accesses a service. It essentially provides an interpreter service translating requests into language the service can understand and returns the results requested. It means that the service can be treated as a black box – requests go in, unseen magic happens, and results come out. An analogy may be useful. You are a customer (application) seated at a restaurant. You are hungry and would like to eat, so you peruse the menu and decide on a steak. You can’t go into the kitchen and cook it yourself or direct the chef to cook it for you. 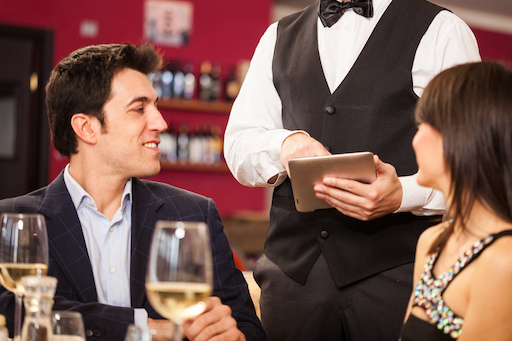 Instead, a waiter (API) takes your order. He or she interprets your specific requirements such as wanting it cooked medium-rare and serving the sauce on the side. The waiter then communicates the order to the kitchen (service) in a manner understood by them. The kitchen staff prepare the meal and ring a bell when it is ready. Neither you nor the waiter know how it was done. Your meal is delivered to your table as ordered. The reverse can happen when it comes to pay for your meal – the restaurant becomes the application requesting a result (payment) from you. In our case, we are interested in accessing external services from our FileMaker solution. This may be to simply push or pull data, or to manipulate data for us. A lot of the services fit into the category of ‘not reinventing the wheel’ – it is far easier and more robust to access a service that is designed expressly for purpose, then to try to build and maintain it yourself. Sometimes the result is as simple as ‘OK’. Sometimes it is a stream of data. To use the API, you need to create a free account. This sets you up with an API username and API key. These are used to authenticate yourself to use the service. It also authorises the service to use credits in your account to send SMS messages. My username is davidhead and my API Key is of the form 5AF333BF-0D51-617D-4586-A1B1188006XX (not my real key). Side Note: if you use the FileMaker function Base64Decode on the encoded text, you will see the original username and key separated by a colon. The ClickSend API documents for “Send SMS” detail the structure of the request including what data is required and in what format. The HTTP request is a POST – data is being sent to the service. Another common method is GET – to request data from a resource. In FileMaker Pro, the request is made with a script step Insert From URL. In that script step, we can specify the URL to call, any options to be sent with the call, and the target for the result (a field or a variable). The options sent with the request are cURL options. These are the request type (POST), an authorisation header (encoded in Base64 as above), a content header (saying the content is in JSON format), and the message properties structured in JSON. The result is received back into the target defined in the Insert from URL script step. This may be a field or a variable. For the ClickSend API, the result is returned in JSON format. It contains a copy of all the data supplied as well as sending information such as message_price (0.077), status (SUCCESS), http_code (200), and more. The result can be parsed into a FileMaker record to save the result of the message send operation. This has been a brief primer on the use of an API in your FileMaker solutions. In this article, we have only considered one example of an API request from FileMaker. FileMaker Server also provides a Data API. This can be accessed by external services to push data into and pull data from FileMaker solution hosted by FileMaker Server. Do you need assistance finding an API or integrating it into your FileMaker solution? Or do you just want to discuss the range of possible options for accessing the myriad of API services out there? We are here and ready to help you. Contact us today. We have just scheduled FileMaker training courses in Singapore in March 2019. Our FileMaker courses are hands-on with small class sizes. They put you on the fast track in FileMaker development. If you, or someone you work with or know, would like to become a better FileMaker developer, have a look at the course schedule now. All courses listed below are currently open and are subject to minimum enrolments before they can be confirmed. When you enrol, you will pay a holding deposit. This is non-refundable except if the course does not run. In that case, you will be notified and the holding deposit will be refunded in full. The decision to run the courses will be made by 12 February. If the course is confirmed, you will be asked to enrol using a coupon code which will provide an additional $100 discount. This introductory course is scheduled for 11-12 March 2019 (Tuesday-Wednesday). Get Started with FileMaker Pro is an introduction to FileMaker Pro and creating custom database solutions. It covers everything from creating a new solution, setting up data structure, customising the appearance, securing and deploying your file and more. Check the full course outline and book here. This intermediate course is scheduled for 13-14 March 2019 (Thursday-Friday). Building Effective FileMaker Solutions is an intermediate course in FileMaker development. We briefly review FileMaker components and then dive into how they really work. The course covers development methods and habits, and a deep look at systems analysis and data structure for better outcomes. Over the two days, we cover many examples of calculations, scripting, security and user interface design. We are also offering an advanced course in FileMaker scripting, scheduled for 18-19 March 2019 (Monday-Tuesday). FileMaker Scripting in Depth is an advanced course in FileMaker development. We will cover all aspects of script editing, management and use. The course covers scripting methods using various classes of script steps. Over the two days, we cover many examples of scripting that will be useful in your FileMaker development. The full course outline is available here and you can book here. We currently have confirmed courses running in Brisbane, Sydney and Melbourne. This means that you can plan your time with confidence knowing that the course will run. 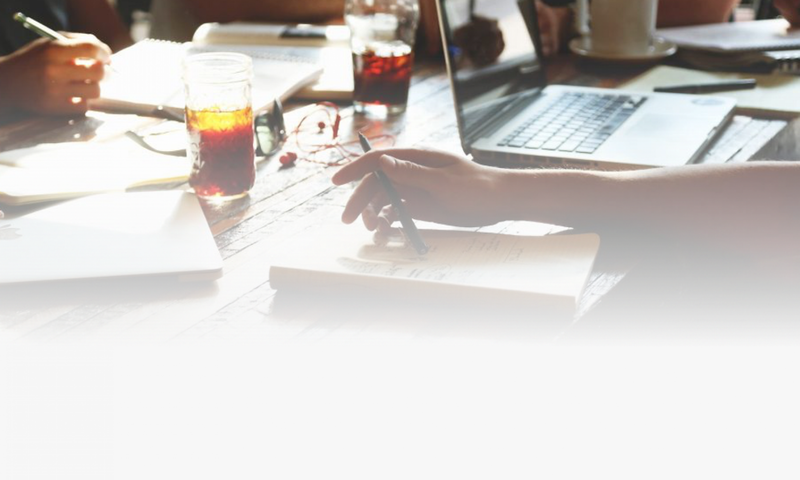 Our training courses give you the fast track in FileMaker development. If you, or someone you work with or know, would like to become a better FileMaker developer, have a look at the course schedule now. It is also open on the schedule for Sydney 28-29 November 2018. Check the full course outline here and book here. It is also open on the schedule for Melbourne 11-12 December 2018. At uLearnIT, we love solving your problems. Here is Part 2 of the latest problem solved for a client using our mentoring services. If you missed Part 1, it is here. In an existing FileMaker solution, we would like to know if certain scripts and layouts are being used. Over the years, the solution has been added to and updated in a haphazard manner and we would like to clean it up. How can we find out which scripts and layouts are in use? From Part 1, the key to this solution is to automatically log the use of scripts and layouts by triggering a script. The script will record the name of the layout or script used and then create a log record. The log record will be created in a special table for the purpose. Open the Script Workspace and open a script. Add the script step Perform Script to the start of the script. Specify the Log script use script. Set the Optional script parameter to Get ( ScriptName ). In the script above, the operation is performed in a card window off the user screen. This ensures that it does not interfere with the user’s normal actions or that of any running script. Since the parent screen does not dim, the user should not notice the script run. The script creates a new card window and goes to a layout to create a new log record. It uses Set Field script steps to set the name field with the script parameter (in this case the script name), and the item field with the text string script. 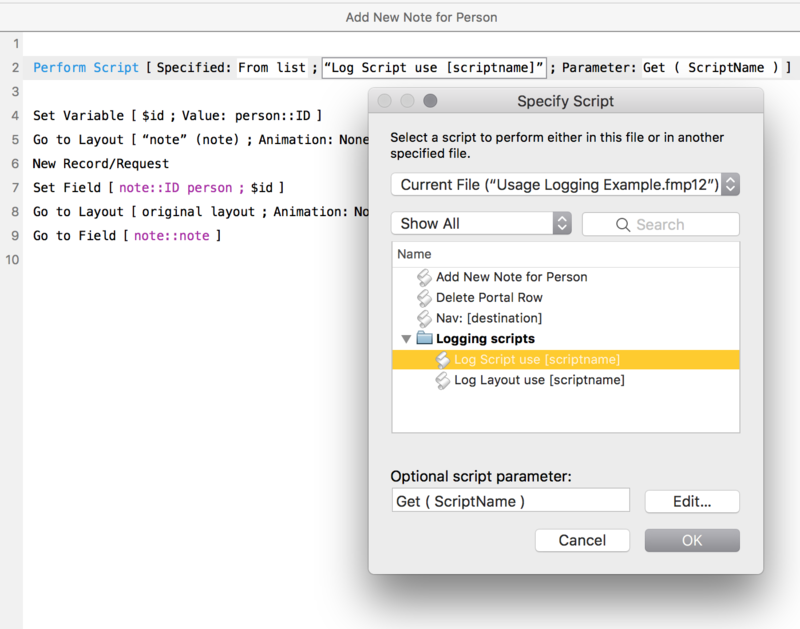 Add the Perform Script step (simply copy and paste between scripts) to every script for which you want to log use. Over time as the solution is used, the log records build an account of script use. This can then be analysed to see which script are most commonly used and which scripts are rarely or not used. A suggestion tweeted by @tonywhitelive was to also record Script Parameter, File Name and Layout Name when logging scripts. The file name would be useful when logging scripts running outside of the file where the log record exists. The script parameter and the layout name will provide some useful data about how and where the script was triggered. So we will need to add three more fields to the log record – parameter, file, layout. And then adjust the script logging script to unpack and apply the various values. These values can then easily be unpacked when received using the GetValue function. So there you have it – even more functional script use logging. Thanks Tony! Do you need uLearnIT to solve a problem? We can do the same for you. Just let us know what you are struggling with and we will provide a cost effective solution. We have saved our customers hours of Googling answers and frustration trying things that never worked for them. Contact us now before you waste any more time! At uLearnIT, we love solving your problems. Here is the latest one solved for a client using our mentoring services. It is unreliable and unwieldy for users to manually log their usage. Often, they do not know which scripts and which layouts they use. If they report the use of buttons, then they also have to report which screen and then the developer has to decipher the use. The item will be set by the script; name will come from the script parameter; account and creation will be auto-entered. Navigate to the layout and enter Layout mode. 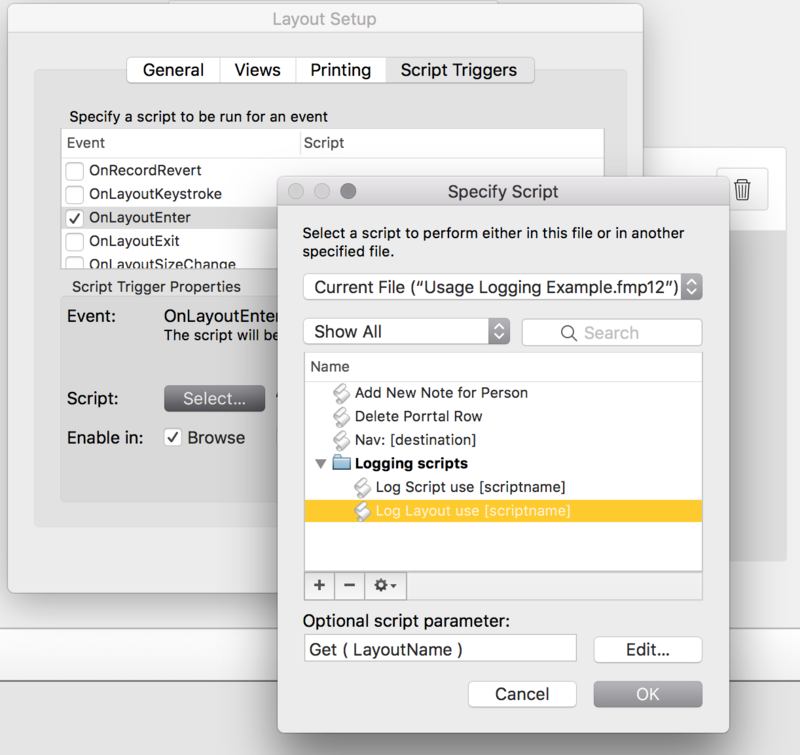 Select Layouts > Layout Setup… and then Script Triggers. Select the OnLayoutEnter event and select the required script. Set the Optional script parameter to Get ( LayoutName ). The script creates a new card window and goes to a layout to create a new log record. It uses Set Field script steps to set the name field with the script parameter (in this case the layout name), and the item field with the text string layout. Repeat the layout script trigger for every layout for which you want to log use. Over time as the solution is used, the log records build an account of layout use. This can then be analysed to see which layouts are most commonly used and which layouts are rarely or not used. In Part 2 of this post, we will look at how to log the use of scripts in a solution. It is a simple extension of the above method for layouts. In our Equipment table there is a field for DOM (date of manufacture). It is defined as a text field since the data is just a month and a year such as 03/10 or 11/15. We would prefer the service techs to enter the data as written. We don’t want them rejecting the process because it’s uncomfortable. But then we need to perform simple calculations on the DOM. For example, if the DOM is more than 5 years past, a “Level 4” service is due. It would be great to allow users to enter a month and year as the DOM in a number of ways. So let’s allow them to enter say March 2015 as any of 315, 0315, 3/15 or 03/15. And then reset the data on field exit to the standard 03/15. This is done with a field option which is an auto-entered calculation. Importantly, the option Do not replace existing value of field (if any) was unchecked – so that the calculation is evaluated when leaving the field. And if all those tests fail, it returns the result “Error”. That may happen if you enter 35 or 032015. Exceptions could be handled in other ways but it was not needed here. Now that we have some standard data to work with, we can easily convert that into a proper date with a calculation. The decision was made to standardise on the first of the month. The field (DOM) is set into a variable called raw. Then raw is processed to get the month and the year – first and last two characters respectively. Then the month and year are used to get the date of the first day of the month. The year is converted into four digits. So that is the simple solution that lets techs enter the date quickly and easily, and then use it to move forward into other calculations to work out service requirements and more. In our last post of this series, we looked at how time and timestamp searches work with the FileMaker search engine. In this post, we will consider searches in calculation and summary fields. The expression is constructed in a calculation dialog with access to fields, operators and functions. 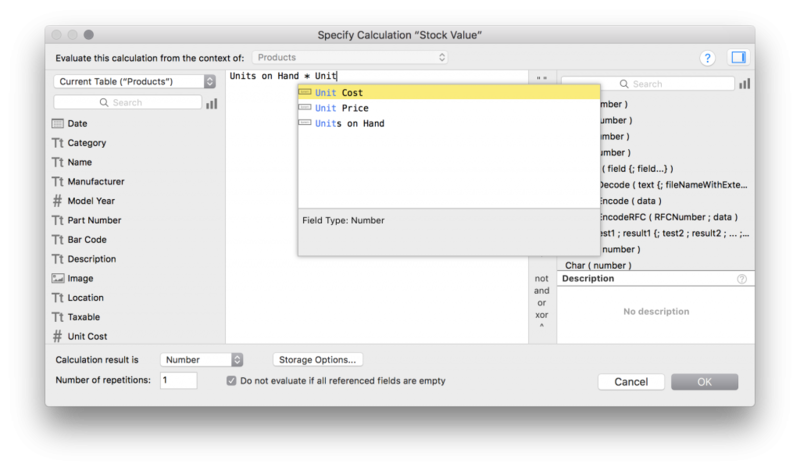 FileMaker Pro provides a typeahead feature making it easier and faster to include fields and functions – just start typing and FileMaker will suggest options. The result type will affect search results on the field. Searches will treat the data as the defined type. 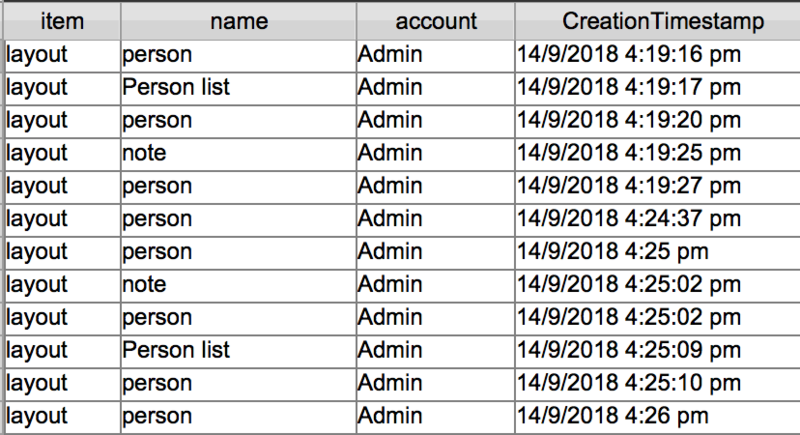 For example, if you create a calculation field for a full name (first name & ” ” & last name) and the result is number, searches on the full name field will not return expected records. This is one of the times that FileMaker presents a double-negative option in a dialog. 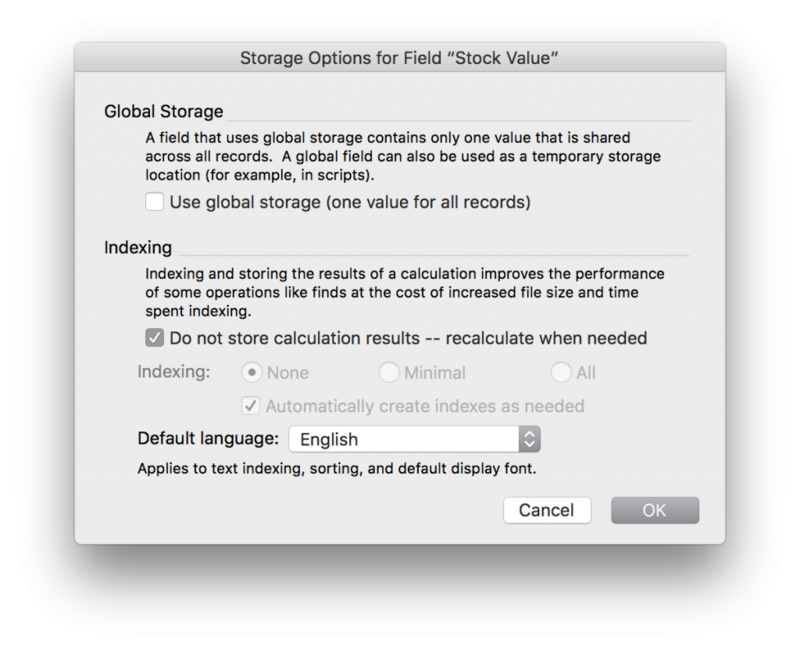 Unchecking the Indexing option means “Do not not store the result” – it will be stored. The option should really read “Store the calculation result” – check for stored, uncheck for unstored. If a calculation result is stored, the field can be indexed and this can improve search performance on the field. However, that may be at the expense of a larger file for both the data and the field index. It may not be possible to store the calculation result. This is so if the expression references a related field, a summary field, another unstored calculation field, or a field with global storage. Calculation fields can be searched just like most other fields. As stated above, searches treat the calculation field as the defined type of data. A search on a calculation field defined as a date result will search as for dates (see the previous article on date searches). If the calculation result is unstored (either by choice or necessity), searches including that field may be slower because there is no field index available and all results must be calculated first to be searched. However, except where there are very large sets of records or the calculation is complex, the FileMaker engine is quite efficient and fast to return a result. As with standard container fields, a calculation field with a container result is not searchable. A summary field provides an aggregate summary of a set of records for a specified field. For example, it may display the average test score for a set of test result records. Since the result in a summary field is for a specific set of records, it doesn’t make sense to search a summary field. There is no access to a summary field in Find mode. In the next post in this series, we will look at QuickFind and field indexing. Objects on a FileMaker layout can be grouped to make it easier to move them around and to maintain relative positions of components. To group a set of objects, select multiple objects and choose Arrange > Group (Cmd/Ctrl-R). The group can be selected with a single click. To ungroup, select the group and choose Arrange > Ungroup (Cmd/Ctrl-Shift-R). In FileMaker Pro 17, the Objects tab (formerly the Layout Objects floating panel in FileMaker Pro 16) displays the group with a disclosure triangle to show items in the group. As with all objects, the group can be given a name (rather than the default “Group”). Do this by right-clicking the name and choosing Specify Object Name. Items in a group may be dragged up and down (changing their z-order or stacking order). But objects cannot be dragged in or out of a group. Multiple objects within the group can be selected in the Layout Objects panel using Cmd/Ctrl-click. This was a big step forward in FileMaker 16 with the new Layout Objects panel. In previous versions, there was no access to objects in a group – the group had to be ungrouped, edited and then re-grouped. In FileMaker Pro 17, individual object access has been made easier. While you can still select an object through the Objects tab, you can also directly select an object in a group. Simply click to select the group, and then click the object. There is a dashed line to indicate the group. Multiple objects in the group can be selected. Also in FileMaker Pro 17, when an object in a group is selected, it can be both resized and repositioned. If it is moved outside of the existing dashed line bounds, the group is enlarged. Effectively, options on the Position tab of the Inspector have been provided for selected group objects. These new features in FileMaker 17 makes it much easier and quicker to work with objects in a group. No more Ungroup – Edit – Group. 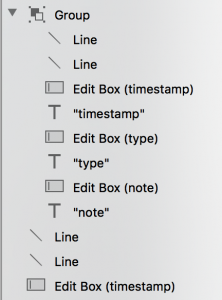 When selecting objects in the Objects tab in FileMaker Pro 17, there is a light grey highlight as you hover over the object, and then a dark grey highlight when you click to select it. If you select an object directly on the layout, it is selected in the Objects tab with a light grey gradient fill. Why is this important? It probably isn’t 🙂 Back to work now.